Stefansson was best known for his role on the children's show, which was produced from 2004 to 2014. He was initially diagnosed with bile duct cancer in 2016, but said it had been removed with surgery. He often shared his treatment and progress with fans online on social media - announcing in March the disease had returned and was inoperable. "It's not until they tell you you're going to die soon that you realise how short life is. Time is the most valuable thing in life because it never comes back. And whether you spend it in the arms of a loved one or alone in a prison cell, life is what you make of it. Dream big," he posted to Twitter. In June his wife Steinunn Olina Thorsteinsdottir revealed the father-of-four's cancer was in its final stages. "Stefan's family wants to express their gratitude for the support and warmth received in recent years, and to express their deepest sympathy to the many friends and fans of Stefan Karl," she posted. The actor spent his early career working in film and theatre - playing the title role in How the Grinch Stole Christmas in the US from 2008-2015. 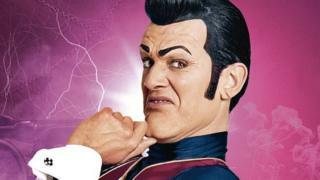 The character of Robbie Rotten was the show's villain and attempted to thwart their schemes, preferring to stay unhealthy. Fans who grew up with the show shared their sadness at the news of Stefansson's death on social media. The character's popularity has continued online in recent years, where his exuberant facial expressions are frequently used in memes.